Diane von Furstenberg is featured in both a new exhibit in Beijing and this month’s Harper’s Bazaar. What does the fashion icon have to say about aging? Designer Diane von Furstenberg is used to creating fashion that catches your attention, but a new exhibit and interview in Harper’s Bazaar puts the focus squarely on her. 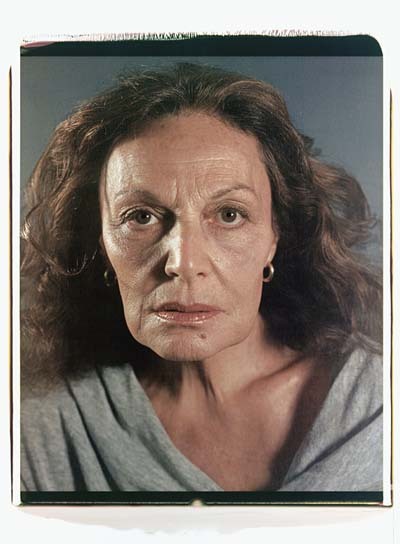 A new exhibit at the Pace Gallery in Beijing — Diane von Furstenberg: Journey of a Dress – chronicles von Furstenberg’s evolution over the last four decades, featuring portraits of her by iconic artists as Andy Warhol, Francesco Clemente, and Helmut Newton along with newly commissioned pieces by Chinese artists Zhang Huan, Li Songsong, Yi Zhou and Hai Bo. She’s also featured in a new intimate interview conducted by iconic photographer Chuck Close. Close manages to get von Furstenberg to dish on plastic surgery and aging in an industry so focused on looks. Close agreed with her views. We love that von Furstenberg isn’t afraid to let her wrinkles show – and she’s walking the walk with that up-close-and-personal photo.